Rebound Lower Limb Injuries Clinic is the premier walking and running clinic and Biomechanics Consultants to The UK Outdoors Industry. The Rebound Clinic specialises in the diagnosis and correction of bio-mechanical dysfunction conditions (sometimes referred to as over-use injuries) and chronic (long-term) injuries of the leg and foot. 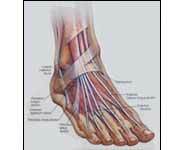 Using the latest movement analysis technology and treatment techniques, we are at the forefront of podiatric therapy. We produce our own orthotics in our own workshop facilities. Chronic biomechanical dysfunction injuries occur when there is excessive movement between joints and/or soft tissue structure. Because these injuries are motion based, it makes sense that only precise observation of a person's individual movement action (their gait) will provide the accurate information required to effectively correct and treat their condition. Using video analysis to examine an individuals gait (gait analysis) highlights bio-mechanical dysfunction and enables pinpoint corrective treatment. The Rebound Clinic is owned and run by Health Professionals Council (HPC) state registered Podiatrist Andrew Stanley. 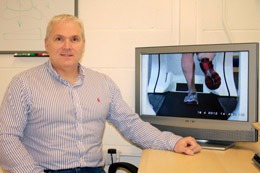 Andrew is an expert in all chronic biomechanical dysfunction injuries in the feet and legs i.e. injuries which occur due to abnormal or excessive motion of the structures in the lower limbs when moving around. Mr Stanley is also the biomechanics consultant for Trail Magazine and the George Fisher outdoor group and regularly writes informative articles for both organisations. Andrew treats all ages and activity levels but due to his own sports background and experience working in sports clinics in Manchester and Lancaster Andrew specialises in sports and activity related injuries. As well as the different age groups he regularly treats varying standards of performers from recreational walkers to professional sports people. The philosophy at the Rebound Clinic is that every step of the diagnostic and treatment process is precisely and specifically tailored to the individual patient's needs. To this end Andrew conducts all clinical consultations and meticulously oversees and supervises the production of corrective devices in the on-site workshop. He personally takes feet casts, modifies devices and fits orthoses for patients - thus ensuring optimum correction and comfort. Clinical Director - Andrew Stanley BSc(Hon) PodM, MChS, SRCh.